Never struck me as anything particularly evocative or really anything more than the resolution of another brainchild of Key’s peculiar fascination with solving unrelated problems with sports matches. But while playing the VN a curious feeling stole over me as the beautiful BGM rolled in when Tomoya scored the final basket. Unlike the anime, there was no animating. 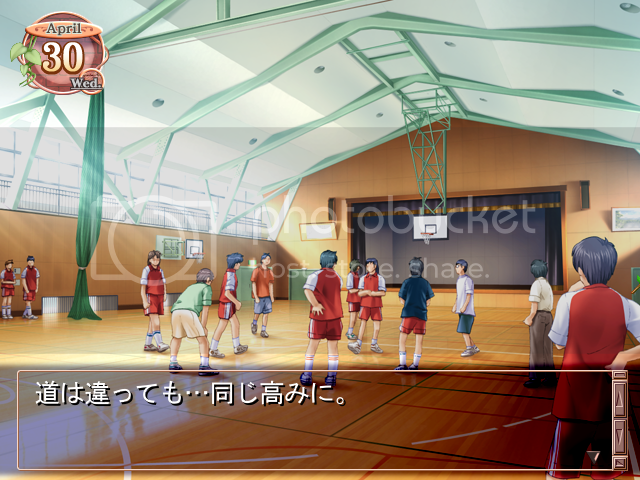 Nothing, in fact, other than a BGM, a single static picture of a basketball court, and text describing the match from Tomoya’s perspective. It’s actually pretty illuminating how incredibly simplistic the Clannad VN engine is – even the simplest renpy games often have more advanced features. Where the anime had Kyoani’s expert animating to give superficial appeal to, the VN was almost wholly reliant on the writing. In the end, the way the story up to this point worked out plus all that additional text detailing Tomoya’s thoughts going through the whole thing gave the conclusion of this random basketball match in the VN an odd sort of radiance quite absent in the adapted version. In fact, unlike in the anime, the choir club people never even came to the match in the VN. In Fuuko’s arc, there wasn’t even a basketball match in the first place, and the choir club folks had their change of heart about the club advisor dilemma anyway. 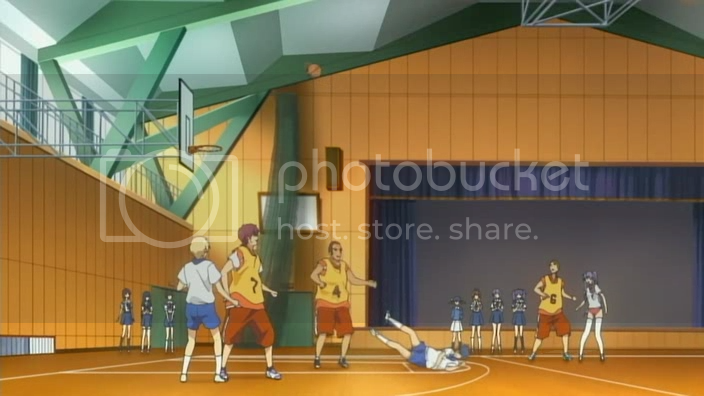 In the VN more so than in the anime, the basketball match didn’t really have any utility at all towards its original stated purpose: Sunohara’s idea of showing the choir club folks that you can’t use a handicap as an excuse. Instead, it became something of a vindication for the Tomoya-Nagisa-Sunohara trio. It didn’t matter that it was all a random idea and no one else was really invested in it in the first place. They set their sights on something, they worked hard for it, and they made it happen. The aftermath for a moment filled me with the heady feeling of their success – they did it. An important difference in the story up to the match in the VN versus the anime is that, necessarily, the anime had Tomoya and Nagisa (and Sunohara) get to know plenty of people after having wound their way through Fuuko and Kotomi’s condensed arcs, and so by the time they arrived at the basketball match plot point they had already gathered a sizable circle of friends. In the VN there was no such thing. There was Sunohara and Tomoya, comrade delinquents and commonly regarded bad company, and their not-so-unlikely friendship with Nagisa, who was herself an outcast of sorts, and the entire story revolved around the three of them, united in their exclusion from the rest of respectable society. On how their comradeship inspired Nagisa to strive for a simple dream, on how that striving for that simple dream slowly struck its chord with Sunohara and Tomoya’s own hidden-away desire to transcend their aimless lives, and how that quiet resonance drove the two to help, support and root for her. They goofed around all the time and none of them probably really knew what they were doing, but they strove, they were met with obstacles, and they fought to move on. More so than the anime, Clannad the VN dwelt intensely on the outcast perspective of school life, on how people tend to fall out of respectable and/or cool cliques due to circumstances they cannot control, how debilitating an effect it can have on you to be constantly frowned upon, and how in spite of it all, you can still find your moment. This was that moment for the three of them. It wasn’t even anything like a planned triumph, it achieved practically nothing in the grand scheme of things, Nagisa’s drama club wish remained in shambles, but these qualities made it all the more fitting somehow. It was a triumph nonetheless, their first after all the setbacks they’ve had. After wandering aimlessly on the edge of respectable society for so long, this was their first full cycle of establishing a common goal, working towards and fighting for it together, and seeing it come to fruition. As Tomoya scored the game-winning basket, his monologue summed it all up perfectly. This symbolized everything: Tomoya with his injured shoulder, shooting for basket in an awkward throw that no proper, self-respecting trained player would ever do, clinching their victory. An awkward, rag-tag, disregarded group, doing things their own clumsy way, could achieve their own triumph as well. “Via different paths… to the same heights”. It was here that the realization hit me that this amazing BGM piece that I had always loved, had been named after this moment all along. Anyway! So that’s that. There are a lot of other minor little nuances and subthemes peppered across the VN that you don’t find in the anime, but at this point I’m not sure that I’m ready to tell you yet that you need to read the VN or you’re missing out. Figuring out the structure of the VN at least has helped me to understand why the earlier parts of Clannad were sort of cluttered compared to the fluent coherence of the After Story parts. Still, let me read further first. I’m only on my second arc – Fuuko’s, after completing Nagisa’s. In contrast with the anime, the individual arcs are actually really long, so it’ll be awhile. I’ll post again if I chance upon something interesting like this one. Fair enough. It’s a little unfortunate that Clannad season 1 had to be the way it is – somewhat weak and awkward, and yet when the actual after story events kick in the show goes into storytelling overdrive. The worst part is I can’t even tell you to just skip the front bits, because it’s all connected and is actually essential towards appreciating Clannad as a whole. Well, for what it’s worth, I’d say give it a try again sometime when you get really bored or something. If you can make it up to about episode 10 of season 2, you just may find the amazing stuff from there on worth everything and more.